Announcer: Welcome to “Training Unleashed,” the show that will help you design and deliver training that’s off the chain, and will make a difference. Now, here’s your host, Evan Hackel. Evan: Welcome to another edition of “Training Unleashed.” We are very fortunate to have a terrific guest with us today. I was in New York at a conference and I stumbled upon him. He was the keynote speaker, and I was just really taken back by the topic and the importance of change. His name is Campbell Macpherson, and I mispronounced it, so please pronounce it correctly. Evan: Thank you. And he is with the Change & Strategy International. And he’s written a terrific book. What’s the name of your book, by the way? Evan: Change is an important topic. And change ties into training because change without training, you know, is sort of like peanut butter without jelly. But why don’t we start with, tell us a little bit about yourself and how you got into the world of change. Campbell: Certainly. Well, I’ve been helping CEOs and leadership teams to clarify their strategy, and lead change, and build cultures that embrace change for almost 30 years, really. I’ve tried different industries, I’ve worked in different roles in different industries right throughout my career, starting with learning how to fly planes in the Air Force, in fact, in Australia. But after that, I really got into change when I was running a multimedia company in Sydney, and we’re hoping to change the way that organizations market themselves using what was CD-ROMs and floppy disks, and then the internet at that point. But actually getting into organizational change was when I joined Anderson Consulting in the late ’90s and headed up one of their change divisions in Sydney that was focused on the insurance market and financial services in Sydney. Evan: So you’ve written this book, “The Change Catalyst,” and I’m, you know, I was about to explain your premise, but I think better I let you explain your premise. What’s the premise of your book? Campbell: The premise of the book is quite simple, really. It’s that change is inevitable, but successful change isn’t. And so in the book, I go through the 10 different reasons why 88% of change initiatives actually fail, which I have found to be a fascinating statistic that came out of a piece of work that Bain did last year. They interviewed 250 different executives from different companies and came up with 88% of change initiatives actually failed to deliver the outcomes that they set out to achieve. And the premise of the book is that runs through why change fails, the top 10 reasons, then goes through the top 10 reasons or essential ingredients for sustainable change. And the key ingredients tend to be people because only your people can deliver your strategy. So the premise of the book is that without your people aligned, and engaged, and embracing change to deliver your strategy, no change will happen. 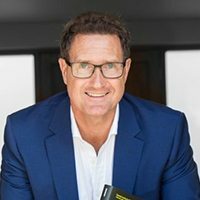 And the vast numbers of reasons why change fails is that leadership fails to be clear about what they’re trying to achieve, about why they try to achieve, why they’re actually trying to achieve what they’re trying to achieve, and also fail to engage their people emotionally in delivering the change. Most leaders tend to engage their people on a very logical basis, and that is just not good enough because emotion is four times more powerful than logic when it comes to the workplace. In fact, it’s four times more powerful than logic in any way of life. We see that in politics all the time. Emotion trumps logic every single time. Campbell: So I didn’t think that one would sneak past. Evan: And my whole premise of the book was that for change…for people to be good leadershipping, that book wasn’t specifically about change, that you wanted to listen to all the stakeholders. You wanted to listen to your employees, the people that are, you know, frontline, you wanna listen to your customers, you wanna listen to your vendors, you wanna get their opinions, you wanna communicate throughout the process, so that when the change decision is made that people feel like their owners, which is what you’re talking about. Campbell: Completely, completely. In fact, change that fails is where they fail to communicate properly. And when I say properly, that means what you just said is they fail to listen because I’ve seen so many change initiatives where CEOs will stand up on the stage in a big town hall speech and give all the logical wonderful reasons of what the future will look like and the wonderful logical reasons for the change. And all of the employees are sitting there thinking, well, A, “What’s it got to do with me,” and B, “This is the first I’ve heard of it.” So they’re just not engaged at all because no one’s listening to it. In change that’s successful, a lot of times when leaders can set a vision and then engaged, firstly, their people, their leadership team, and then all of the organization and working up, well, what are the implications of this vision? Now, what could possibly go wrong is something that I asked in workshops, and engage everyone in working out how to deliver their change. But that requires leaders who are very strong, and are very confident, confident enough to actually have their vision tested by their employees in some way. So employees want to know that leaders have a vision for where they’re gonna take them, but they also want to be involved in working out how to get there. And I think when you’ve got that combination of actually leaders who listen to employees and then employees who are engaged with change, but also know how to embrace change and that are afraid of change, then you get success. But as we said in the opening, that only happens about 12% of the time, and it’s quite remarkable. Announcer: “Training Unleashed” is brought to you by Tortal Training, specializing in eLearning and interactive online training solutions for corporate, government, nonprofit, and franchise organizations. Tortal makes effective training easier. Just go to tortal.net to gain access to real world tools that can make a difference. That’s tortal.net. T-O-R-T-A-L. tortal.net. Evan: I think it’s human nature for people to first question, and doubt, and have defense. But when they hear something, they’re not hearing it like, “Oh, this is interesting. Why will this be good?” They’re hearing this with, “How is this bad, how will affect my job, why don’t I like it?” And that’s what happens when you just hit them with it rather than the part of embracing them in the conversation so that when the time comes, that they feel comfortable and they really are open-minded. Campbell: That is so true. That is so true. And in fact, what I described in one of the training courses that I run for leadership teams on leading change, I also do courses for employees on embracing change because leaders can’t lead if they don’t have followers, and the followers have got to be able to be up for the change. They’ve got to be comfortable with change before they will then acquiesce to actually change. So I run through that there are different types of change. And I think there’s a…I draw a little two-by-two matrix where you’ve got the size of the change, from small to large, and you’ve got the amount of personal control that you have. So if you’ve got a small change that you’re in control of, well, that’s absolutely fine, that’s really called pedestal development. If you’ve got a small change that is being forced on you, then it’s easy to adapt. It could be a change in a process for a change in a form. It’s like, “Yeah, okay, I’ll adapt to that.” But when you get big change that is forced upon you, that’s when you really…that’s really change that rocks your world. That’s really when you set back in your seats, and it could be a reorganization of your company, a loss of your job, it could be a million things, but it’s big change that is actually forced on you. And you’re right, the first phase is not excitement, but the first phase that everybody goes through when they’re have big change forced upon them is shock. They go through shock, they go through a state of denial, they get angry, they get scared, and they get depressed before they didn’t move up the other side of the change driven, and start to engage their head and understanding what has happened, and then finally, their heart and accepting it. But you’re very right, change is a very emotional thing. And it’s the first reaction is always shock, it’s never excitement. Evan: So I’m gonna ask you a question everyone asks me, and after you answer, I’m gonna answer. Why is it that management is so resistant to opening up and getting feedback and input before making major decisions? Campbell: Now that is a great question. That is a great question. I was talking to an executive about this very thing, actually, today at lunch. And he said that he thinks the reason is that most of the time, IQ is more valued than EQ, particularly in financial services, I was talking to a financial services executive, so the people that make it to the top in business, particularly in financial services, are very high IQ. And they get there because they make decisions, and they take no prisoners, and they get on with it, but they have a very, very low EQ skill. So when they get to that stage, they think that good leadership is about taking control and telling people what to do. So I think maybe it’s part of our capitalist system. Maybe it’s part of corporate life is that those who get to the top have got there because they’ve got a very low EQ. Anyway, because we were debating this over lunch today, it’s a really [inaudible 00:11:21]. Campbell: Yeah. And that’s where we were going today, okay. Evan: …rather than hoping and inspiring. Evan: I don’t know if you know Jeffrey Hayzlett. Campbell: Yes, I’ve met him in the same conference, actually, yes. Campbell: I wouldn’t have [inaudible 00:12:52]. Campbell: It is a good question. Well, my initial answer was it’s in a high IQ. There’s also a disconnect because…and I was talking about this at a [inaudible 00:13:12] with the client the other day. We’re having a big session on change with all the best CEOs that flew in from around the world. And one of the things we’ve realized is that the leaders went back to the matrix that I drew in midair. The leaders, when they instigate a big change, they’re instigating in the organization and the first thing you feel when you’re instigating big change is excitement. You then will start to doubt and have a few concerns, but the first is excitement. And what I try and do, and this is where training obviously is the only way to do it, is to try and get them to understand to empathize with their employees that to understand that going through shock and them empathize with them to say that the fact they’re in shock, the fact they’re in denial, the fact they’re in…that they become angry after they become fearful is not negative. You shouldn’t take it out on them, it’s just a natural human response to really big change that’s being forced upon you. Evan: Yeah, well… But this isn’t being recorded visually so they don’t…no one’s seeing the arms. But change and training go hand in hand, right? And maybe talk about the importance of training and being involved in change initiatives. Campbell: Well, one of the best research surveys, pieces of work that I’m aware of in this space was done by the Corporate Executive Council back in 2003 or 2004. And they interviewed 50,000 employees from companies from all around the world. And they came to the conclusion, several conclusions, but one of the key conclusions was that emotional commitment is four times stronger than logical commitment. So they then also showed that companies that have a workforce that is emotionally committed to the vision, to achieve it, to the strategy also have considerably higher shareholder value. But the most important outcome of this report is that the driver of emotional commitment is the person’s line manager. So it doesn’t matter where you are in the organization, it’s your line manager’s this ability to manage that is the most important driver of, one, emotional commitments would then follows on to shareholder value. So when I saw that, when I was HR director many, many years ago of a financial services firm, that was the evidence, that was the rationale that I needed, the logical rationale I needed to convince the rest of the board to invest in management development and leadership development because it had a direct flow on to the bottom line, a direct flow on to delivering our strategy. Announcer: We’re so glad you’re listening to this episode of “Training Unleashed,” brought to you by Tortal Training. The difference between Tortal Training and other online training companies is we are primarily a training company with technology rather than a technology company that does training. Wanna find out more? Just go to tortal.net. That’s T-O-R-T-A-L. tortal.net. Evan: Development is a nice word of saying training. Campbell: It is, it is. Evan: Because we’re on a training thing. And I’ll also point out if the change involves skill changing because I can’t tell you… You know, I checked into my hotel today, it was a terrible experience, right? And the person explains to me they had new software. And so, obviously, there’s change taking place. But that person wasn’t trained on how to handle the change. Campbell: Now, that just seems to be so fundamental, that’s… Yes, yes, I agree, I agree. Evan: Now, I’m gonna tell you another quick story because this is kinda funny. A major company, and I’m not gonna say who it is because that would be bad, one of the things our company does is help people redesign their internal communication, their internal intranets because what they end up having is becoming spaghetti, they just get built upon, built upon, and that you need to streamline, think, and simpler is better. Evan: But, you know, it’s just bad. So I think everyone here notices that you’re not from the States. But there could be people that are inspired to say that they wanna talk to you because change is a big issue, you are the change catalyst, and they might want to engage you in a service. You know, in the bio of you, we’re gonna list your website and all of that. But, you know, do you come to the United States? Do you do engagements or where do you focus your business? Evan: The simple answer to the question is if they like what they’ve listening to and they feel they could use your help, they can contact you with the information below, and coming the United States is not something you’re unwilling to do because you’re here all the time. Campbell: Would you like me to repeat that? Evan: We’re out of time. We end these always with the same question which is, what one tip would you share with people, one piece of advice? Campbell: My single tip for leaders, for trainers, for executives of all types, just for everyone, is to be yourself. In the book, I talk about what a good leader looks like, and I go through all sorts of different details and what good leadership is like, what bad leadership is like, but I end with “be yourself” because if you’re yourself, you’re genuine, and when you’re genuine, then people will listen to you and you have a damn good chance of being successful. Evan: That’s great advice. Great advice. I wanna end by thanking you, but also the fact that you highlighted 88% of all change initiatives, I might have had that off by a percent or two, fail is crazy. And if that isn’t something to inspire people in the world of training who can have a major impact on improving the effectiveness of change, and if that doesn’t inspire leadership to seek to involve the entire organization, to build that emotional connection, nothing will. And this has been really a great podcast. Thank you so much for being on. Campbell: Well, thank you for the opportunity. And looking forward to doing it again someday.